Fortnite’s replay system is now live and we couldn’t be more thrilled to finally put it into your hands. We’re issuing an all-hands-on-deck situation: We want to see what you can do with this nifty new system, creating your best Fortnite Battle Royale highlights video! For more details on the new replay system, head here. Glad you asked! 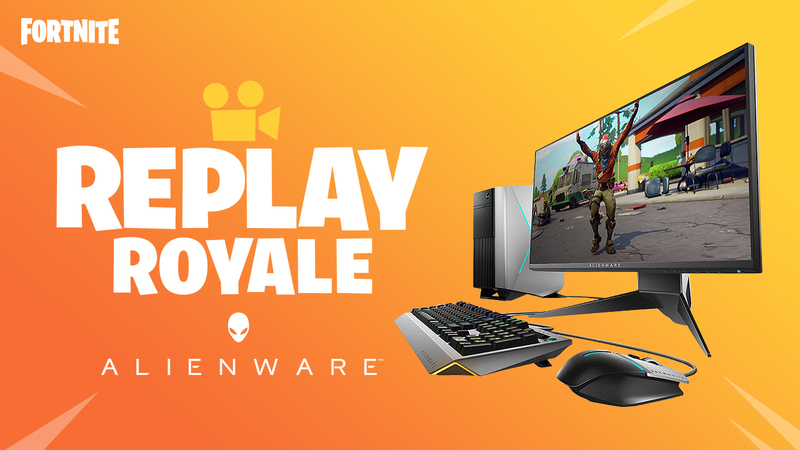 Submit a highlights video of your own gameplay using the new Replay system tools for a chance to win a high-end Alienware Aurora PC package, Atomos Ninja Flame high-resolution monitor-recorder, exclusive Fortnite swag, and more! NOTE: Your submission must be original and can only include personal gameplay. The contest begins today, April 13 and runs until April 26. Send us your best by April 26 at 11:59 ET to be eligible. For the full rules + requirements, head over to this blog! We will now begin reaching out to winners and granting prizes! Please check your YouTube messages or email if you're a winner. You will be contacted by the official Fortnite YouTube account or an official Epic Games representative. Congratulations winners and a big thanks to everyone who participated! Did the video display a mastery of the Replay system? Did you utilize the tools of the Replay system (i.e. - exposure, aperture, etc.)? Was your video primarily composed using the Replay system? Did your highlights manage to represent the game in a creative or innovative manner? How well did you capture the tone of Fortnite Battle Royale through your highlights video? In order to submit your highlights video, you must add #ReplayRoyale to the metadata + description of your YouTube video.